Rheumatoid arthritis (RA) is the prototype autoimmune disease but related mechanisms are involved in numerous other physiological and pathological conditions such as ageing, osteoporosis, chronic osteomyelitis and fracture healing. This article is a review of cellular and molecular components of the immune-inflammatory response in RA with a focus on candidate novel biomarkers that may take us one step closer to the modern quest for personalised medicine. Rheumatoid arthritis (RA) is a chronic inflammatory arthritis of unknown aetiology. An autoimmune, auto-inflammatory pathogenic mechanism is central to disease initiation and perpetuation. Recent insights into the molecular pathways characterising these pathogenic processes have not only led to numerous innovative therapies but have also provided a better understanding of the immune-inflammatory response. RA is the prototype autoimmune disease but related mechanisms are involved in numerous other physiological and pathological conditions such as ageing, osteoporosis, chronic osteomyelitis and fracture healing. Despite clinical similarities, patients with RA are a very heterogeneous group with regard to disease progression and response to therapy; thus reliable, predictive biomarkers would be invaluable. The innate and adaptive systems are two components of the immune system acting in concert to defend against foreign infections and to promote healing following an injury. The innate response is the initial non-specific response to foreign antigens comprising cells of the macrophage monocyte lineage, neutrophils and complement: the predominant effector mechanism being phagocytosis. Macrophages not only phagocytose foreign tissue but also process the antigen for presentation and activation of the adaptive immune system. 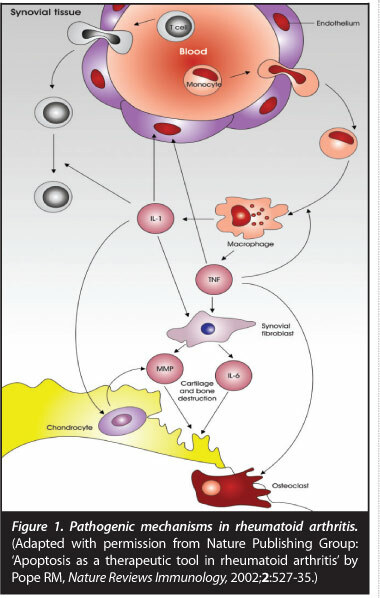 The adaptive response is a delayed but specific response comprising T and B lymphocytes. It is initiated by antigen presentation and activation of naive T cells. Depending on the stimulus and host factors, T cells differentiate into a TH 1 (cell-mediated response), TH 2 (humoral/antibody-mediated response), TH 17 (pro-inflammatory response) and regulatory T cells (inhibitory response). A crucial host factor is the major histocompatibility complex (MHC) or human leukocyte antigen (HLA) which is the chromosomal area important for self-recognition and displaying of antigens to T cells. T-cell activation results in a response generating specificity and memory to a particular antigen. Cytokines are molecular messengers playing an integral role in the cross talk between various components of the immune response and host, allowing for a co-ordinated and regulated response. Despite intensive research, the inciting agent triggering RA remains elusive. Genetic and environmental factors play an important role in RA susceptibility and progression of disease. Genetic markers, termed the shared epitope, have long been associated with RA. Enzymatic conversion of arginine to citrulline (PAD14). Once initiated this pathological loss of self-tolerance results in inflammation predominantly in synovial tissues, resulting in synovial hypertrophy and pannus formation. Inflammation and tissue destruction may result in increasing the antigenic load, consequently resulting in auto-inflammation and perpetuation of disease. Synovial pannus is characterised histologically by new vessel formation, cellular and molecular components of the immune response, synovial fibroblasts and destruction of adjacent cartilage and bone (Figure 1). With the recent advances in the management of patients with RA, the need for early diagnosis and rapid disease control is paramount to limit morbidity and premature mortality from RA. Clinical, imaging and laboratory biomarkers are being used to diagnose and monitor disease progression, usually as composite scores of a range of markers. Current biomarkers in use, although valuable, fail to diagnose or monitor disease activity effectively. Candidate novel markers that could contribute to improving RA management are those integrally involved in the immuno-pathogenesis of RA. Clinical measures such as joint counts for swelling or tenderness and global assessments of disease activity by the physician and patient using a visual analog scale, are commonly used to assess disease activity and response to therapy. The erythrocyte sedimentation rate and C-reactive protein (CRP) are included in some of the disease activity scores. Unfortunately even in patients with low disease activity scores, patients may have ongoing radiographic damage and significant disease progression. Newer imaging modalities such as ultrasound and MRI hold promise in monitoring disease progression and response to therapy early in disease management. Doppler ultrasound activity and MRI marrow oedema have been associated with erosive radiographic progression. Meyer et al in a cohort of predominantly black South African RA patients, showed an association of the shared epitope with RA in 88% of patients similar to other studies in Caucasians, but the association did not add more predictive value than the presence of RA-specific anti-cyclic citrullinated peptide antibody (aCCP Ab), thus limiting the clinical utility of shared epitope genotyping.8 The presence of the shared epitope may also have prognostic value as several studies have shown an association with more aggressive disease. Rheumatoid factor (RF) is one of the well-established laboratory markers associated with RA but sensitivity and specificity, especially in early disease, may be as low as 50%. The addition of the aCCP Ab increases specificity to greater than 90%.1 Antibody positivity also has prognostic value with aCCP Ab being associated with erosive disease and radiographic progression. Titres of these anti-bodies are now considered important as greater than a three-fold elevation increases the likelihood of diagnosing RA, using the new criteria (Table I).7 A decrease in aCCP Ab titres with biologic DMARDs has correlated with clinical response and may be a marker of response to therapy. 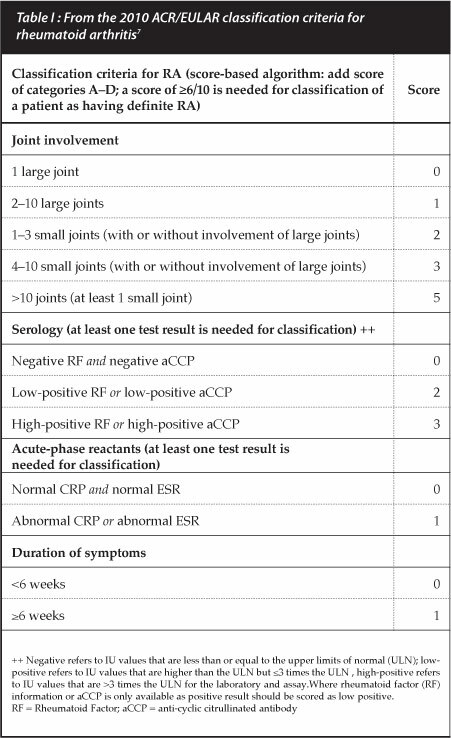 A cost-effective recommendation for clinical use of aCCP Ab is to request the test only if RA is suspected and RF is negative.9 The clinical utility of using these auto-antibodies to monitor disease progression has not yet been established. Cytokines are important molecular components of the immune-inflammatory response and integrally involved in the pathogenesis of RA. Their importance is underscored by the success of numerous newer therapeutic agents targeting specific cytokines or their biologic pathways. Baseline RANKL levels and serum RANKL/OPG ratio may identify a subset of patients more likely to respond to TNF treatment, and patients with very high serum TNF values were found to be more refractory to treatment.10,11 Biomarkers reflecting enzymatic processes associated with breakdown of bone and cartilage have been shown to be associated with radiographic progression. Independent predictors of radiographic outcome include matrix metalloproteinase -3(MMP-3) and COMP.12 MMP- 3 has also been found to correlate with erosive disease despite a normal CRP. In a cohort of 128 early RA patients, MMP-3 levels correlated with measures of disease activity but did not add any more value than the CRP.13 Serum levels of cathepsin K have been shown to correlate with radiological damage in patients with RA.12 However, serum correlations of these novel biomarkers with disease activity or as predictors of response to treatment has been inconsistent and of limited clinical use as independent markers. Recent developments in the use of some of these novel biomarkers as composite scores together with other measures of disease activity have been made commercially available but their clinical utility needs to be validated. As the aetiopathogenic mechanisms underlying RA unfold, more candidate biomarkers and potential therapeutic targets are being explored. Recent advances in RA management have brought with them challenges to select specific therapies for specific situations, and no single measure is likely to emerge as the gold standard. Composite scores using clinical, imaging and laboratory measures are likely to come closest to meeting the ideals of personalised medicine.